I told you the addiction to these little "Fox & friends" from the Occasions Mini is terrible.. in a good way. I have an attraction to this little owl, since its the only animal my son still has interested in. As a small child he liked owls.. for whatever reason no one understood this. We would spend long hours at museums where they had exhibits of owls. I would only be interested in since it was apart of what he liked, though I truly would get alittle creeped out myself! 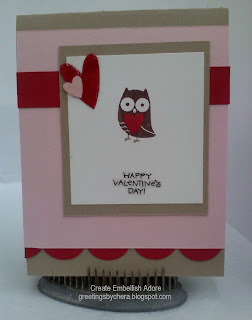 Here is the owl, with some hearts (Three heart punch) hanging out for Valentines day! Fox & Friends stamp set with pink, red, white & Kraft Cardstock. Chocolate Chip ink for the owl. Three hearts punch and the 'scallops' on the base is the heart punch. And if you follow this blog at all, the answer to the lingering question.. Yes there is a pair of boxers with an "owl" on them for his Valentines! HA HA !